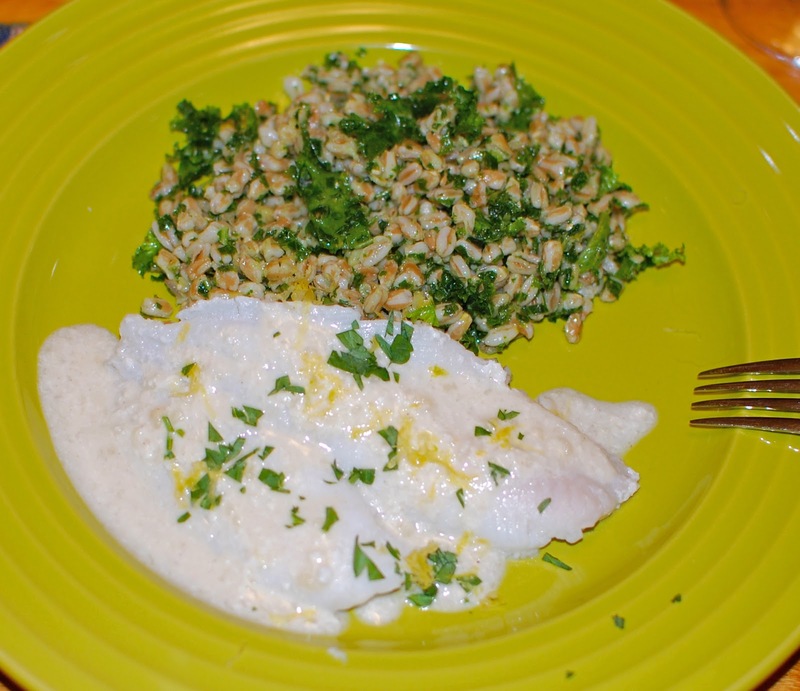 Buttermilk Poached Flounder & Farro with Kale Pesto | We Like to Cook! It has been quite a while since we have done a recipe challenge, so when the awesome folks at Garnish & Gather tasked us to develop a healthy, easy meal on a budget using seasonal ingredients available in September. As the days of summer are waning, more leafy seasonal greens are hitting the farmer’s market tables. The days are still warm enough to have us yearning for some healthy fish options like flounder which is available year-round, while the cooler evenings leave us craving heartier grains like quinoa or barley. This menu features a combination of these ingredients to result in the perfect late summer/early autumn meal. This meal sounds so elegant and sophisticated, but in reality is very easy, forgiving and full of wonderful flavors with zesty lemon pulling the whole meal together. Best of all it is super nutritious! This recipe feeds two people generously or can be doubled to feed a family of four. The addition of fresh vegetables such as chopped tomatoes and cucumbers with basil or a fruit salad would make a fabulous accompaniment as well. For the Salad: Rather than including a heavy portion of rice or potatoes, this farro salad is made lighter with the generous addition of kale. The kale does double duty by becoming part of the dressing as well as part of the salad. In a medium saucepan, cook the farro in salted boiling water until al dente, this should take about 30 minutes. 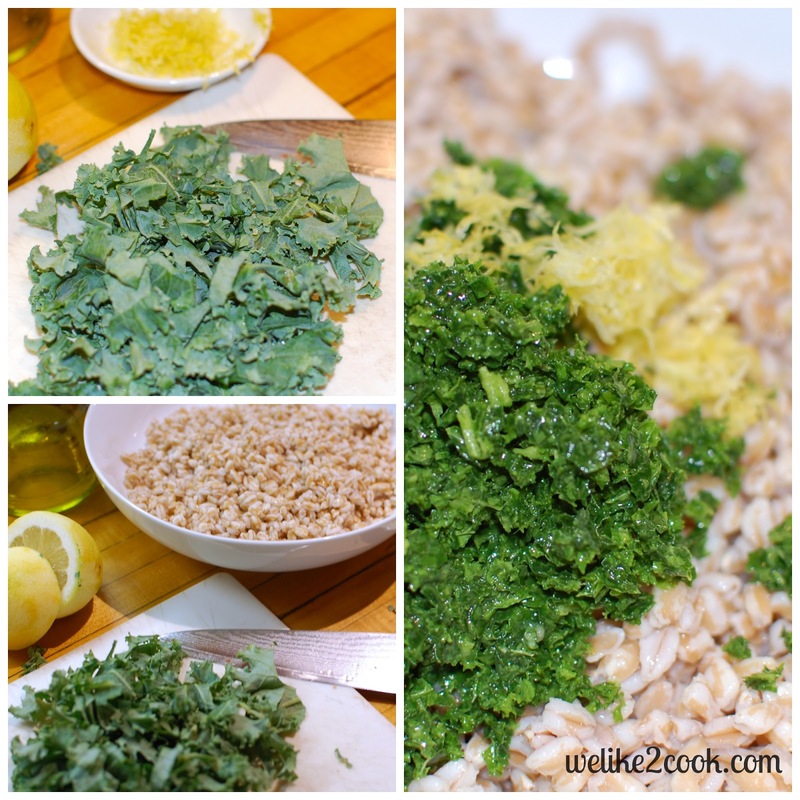 While the farro is cooking, pulse 1 cup of the kale with the lemon juice until roughly diced in a food processor. With the machine on, slowly drizzle in the olive oil until smooth. Don’t have a food processor? Mince the cup of the kale and mix with lemon in a mixing bowl and stir aggressively. Drizzle the olive into the mixing bowl as you continue to stir aggressively. When the farro is cooked, drain well and transfer to a large bowl. Let cool slightly. Then scrape the kale pesto into the farro. Add the lemon zest, if using, and the remaining kale leaves that have been roughly chopped. Season to taste with salt and toss well. This salad can be made ahead and refrigerated as time allows. For the Fish: Poaching is just a fancy term for simmering proteins in liquid. Buttermilk does an amazing job of cutting the “fishiness” that some people associate with flaky white fish while providing the perfect poaching liquid. Creamy and tick, buttermilk just tastes rich while in reality it is low fat and provides a tangy base for the addition of lemon and coriander for the finished sauce. 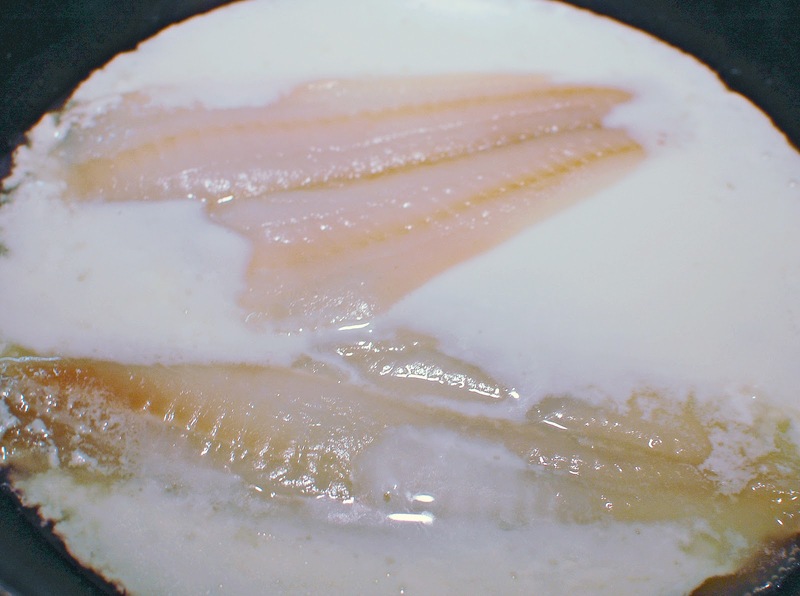 We chose wild caught flounder because it is available year-round and is usually inexpensive. You could use any flaky white fish for this recipe including halibut, pollock, haddock or perch. To cook the flounder, pour the buttermilk into a large pan or skillet and bring to a simmer over medium heat. Gingerly slip the fish into the skillet, cover, and poach for 3 to 4 minutes, until fish is nearly cooked. Using a spatula, carefully remove fish from the pan. Add lemon juice, flour, salt, coriander and pepper to the buttermilk in the pan and bring to a boil over medium-high heat. Boil until the buttermilk is reduced by half, about 5 minutes. When the buttermilk is reduced, turn the heat to low and return the fish to the pan. Simmer for about 1 to 2 minutes longer until the fish is opaque and flakes easily when tested with a fork. 1 cup milk + 1 tablespoon lemon juice - Let stand for five minutes prior to use. 1 cup milk + 1 tablespoon vinegar – Let stand for five minutes prior to use. 1/4 cup milk + 3/4 cup plain yogurt - Whisk together until no lumps remain. 1/4 cup milk + 3/4 cup sour cream - Whisk together until no lumps remain. designed exclusively for the Garnish and Gather Recipe Challenge. That sounds like such a great dish! I love seafood so I'm always looking for new recipes. Thank you for linking at the In and Out of the Kitchen Link Party. Hope to see you again next week.